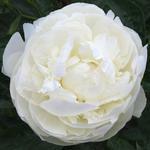 Peony flower buds can be stored dry, packaged in plastic and laid flat on the shelves of a household refrigerator. One may be surprised at how many buds can be so stored on one shelf. Stored in water is good too, but requires a lot more room. Most kinds can be held for two or three weeks, some up to twice as long and still give a good vase life. 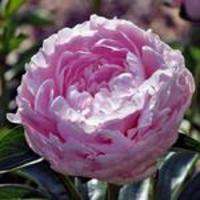 Almost all peonies will hold a few days cut; some kinds are better, whether used immediately or out of storage. The cold serves to slow development of the flower. The longest storage life is obtained with quick cooling and storage temperature of 32 degrees Fahrenheit. However, a refrigerator is more in the range of 36-40 degrees. At the higher temperature, storage life is somewhat reduced. With experience (or luck) this may be partly compensated for by cutting at a tighter bud stage. For shorter-term storage, also with the more doubled flowers, the guideline is to cut when the flowers are in the "soft" bud stage. Hold the stem between two fingers under the bud and press with thumb on top. If the center of the bud feels about like a fresh marshmallow, it is at soft bud. For the many-petalled, full double flowers, part of the petals will be unfurled. 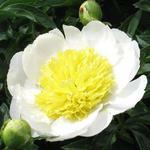 Single, Japanese, and Anemone type flowers open more easily and should be cut firmer than the soft bud. Last year, at the end of April, we cut Roselette when the buds were about to show a line of color, but still fairly hard.. Four weeks later, on Memorial Day, they provided excellent blooms. With the Bombs, the general rule is to cut when the bud covers are loosening and an edge of the true color showing. Try it. Success improves with experience. 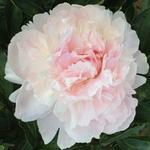 Cut softer, any peony opens sooner, if harder it develops more slowly. The one extreme is that they can be cut so hard that they never open. The other is that they can be cut so advanced they expend their vase life potential while yet in storage. For packaging, we put the cut stems in thin plastic bags, closed tightly against drying. In a pinch we use plastic grocery sacks and tape the holes to reduce drying. Karen Gast, PhD., who has the Kansas State University cutflower peony research and demonstration project, uses the 2-gallon size Ziplock bags or equal. Frost-free refrigerators can be harsh, be sure the stems are packaged against extreme moisture loss. Remove almost all of the leaves from stems to be stored, both those stems intended for floral decoration and those to be held for competitive exhibition. This procedure cuts down on bulk and greatly reduces the surface area giving off moisture in the bags. What remains is how to handle the flowers upon taking them out of storage. The flowers will be wilted and the cut ends will have dried. Re-cut the ends to expose fresh tissue and place in tepid water. Preparing the stems in a cool room and out of any draft will enhance the opening process.